When NT Rama Rao (Nandamuri Balakrishna) establishes the Telugu Desam Party in 1982, he becomes an instant mass leader in politics. Touring the then united State of Andhra Pradesh on his Chaitanya Ratham, he rallies the people on the slogans of Telugu pride and social justice. Troubles begin more than a year after the thespian-turned-politician becomes the Chief Minister. 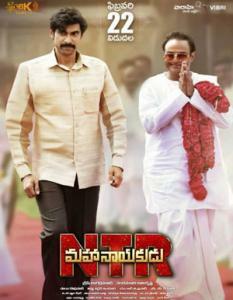 Nadendla Bhaskara Rao (Sachin Khedekar) stages a coup when NTR is away in the US for an angiogram. Upon his return, the cheated Rama Rao roars. Rest, as they say, is history. The second half of the film is about how NTR regained power with the help of Chandrababu Naidu's (Rana Daggubati) deft political management and maneuvering.